Milwaukee has come out with a new M18 cordless random orbit sander, 2648, which they say provides corded power and more control. Notable features include a speed control dial, 3/32″ orbital diameter, 5″ pad size, and both a dust collector and universal hose adapter. 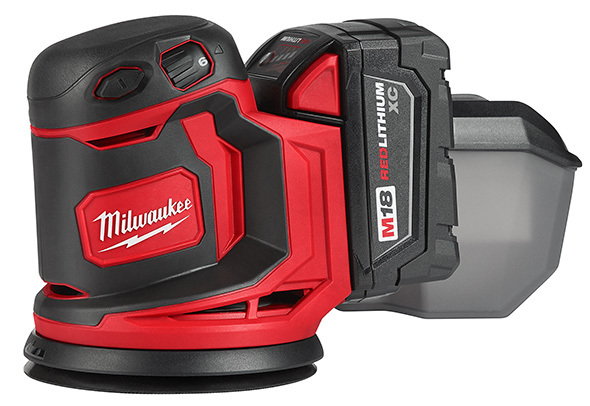 Milwaukee boasts that the new M18 cordless sander delivers true corded power, and that it removes more material per charge when compared to other cordless sanders on the market. 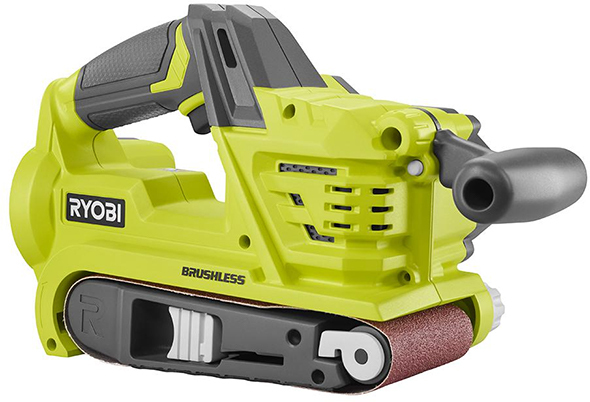 Available as a bare tool (2648-20) or in a kit (2648-21) with charger, 3.0Ah XC battery pack, bag, hose adapter, and 2 sheets of 80 grit sandpaper. 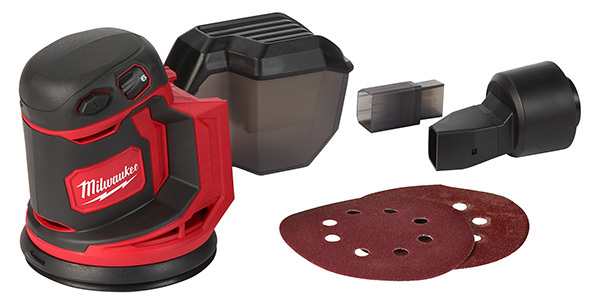 From the images, it looks like the new sander can work with standard 5″ 8-hole hook and loop sanding discs. I wonder what the runtime specs look like. and why this isn’t boasting a brushless motor. I’m thinking that maybe they’ll see how well this sander sells, and if it does well, maybe we’ll see a brushless 6″ sander. Update: Runtime is said to be up to 35 mins on an M18 3.0Ah XC battery pack. Based on what I’m seeing, I’m very optimistic about the new sander. It’ll never replace corded or air sanders, but should be a good fit for quick applications where a corded tool might be unwieldy or inconvenient to use. Copy it, whack in a BL motor and claim superiority over this and the Ryobi version. They need to get rid of that terrible terrible proprietary hose attachment system or at least include the $20 adapter for standard vacuum sized ports. Please do, I need a cordless sander. Either Dewalt 20v max or Milwaukee M12. consider it bought already, but hey im sucker for the red and black. I’ll use this as just 1 more opportunity to let Milwaukee know that i’m waiting on a jigsaw update hint hint. I’m throwing money at the screen but nothing is happening! I’ll buy it the second I see it. So many little quick projects it will be awesome on. Yeah same thought, why not Fuel !!! Its about time. Have ya seen the M12 inflator? Another long overdue item from Milwaukee. 2475-20 model # on that. Looks like the bare tool will be anywhere from $69 to $79. That’s fantastic! When I saw the headline I thought it was a corded model. I was also thinking how much can a company really improve on the corded models especially with the variable speeds offered? Then I realized that it was a cordless! What applications would a cordless sander have? Any super small jobs I used my cordless multi tool and when in the garage I just grab my corded finish, orbital or belt sander. It this just a marketing ploy? Help me out here. We preferred corded or pneumatic tools in the shop. We preferred corded or pneumatic tools for very demanding (e.g.. long duty cycle) work on jobsites. We preferred cordless tools when working in tight spaces, up on roofs, off of ladders or on staging, out of doors where running cords would be a nuisance or dangerous – and for most punch-list jobs. So (as an example) if I needed to sand some 2nd story shutters in place I’d prefer to have a capable cordless sander. No problems with a corded sander in the shop, since I likely have a vacuum hose hooked up anyway. In the cabinet shop (I’m retired now for over 5 years – so my thoughts may be a bit dated) – we could not beat out air sanders for nearly continuous duty. We had mix and match brands like Cleco, Dotco, Dynabrade and Hutchins. I’ve been extremely happy with my ryobi cordless sanders. I know this is a milwaukee thread but if their ryobi orbital is great i’m sure the milwaukee should be better… Unless its like their nail guns…. Nice, now for a compact router.the bag looks huge…. Not that big a deal to have a corded sander so for that price point it’s a no go unless the preformance is as good as corded. I have the ridgid cordless sander and I don’t use it all the time but when I need it it’s great. I body filled fastener holes in metal door frames and had 20 some frames spread out around the site, used the cordless sander and it worked perfectly. I was waiting on it for a while and had to get Ryobi instead. Well, $30 without adjustable speed works well. Run time is about 30 minutes on 4.0 battery. I am sure this one is much better but extra $70 for a temporarily use ..nah, I’ll keep green for now. They have a chainsaw – 2727-21HD. It’s pricey, but there. Looks like SBD is testing in Greece. Dewalt version prob be similar to this and porter cable. They have Pirter Cable and Black & Decker of similar design. A Dewalt version would have to be different to be worthwhile. I really want a new Fuel jigsaw or at least an updated m18 jigsaw. A corded ROS for me is ok.
I’m always excited about new Milwaukee cordless tools. Any opportunity to further cut the cord is great. I have a small shop (shed) and often times end up working on projects out in the backyard on sawhorses and don’t like having to run a cord out there. However, I have the corded Milwaukee ROS and sent it in once because it started smoking after sanding down all my kitchen cabinets (small kitchen). It also felt like the brake didn’t really work properly and was always running at high speed regardless of what setting it was on. When I got it back from being repaired, it was mentioned they also replaced the brake. Now it seems to hold the variable speed I’ve selected while I’m sanding but if I lift it off to move the piece and sand another side it very quickly ramps up to crazy fast speed and then gouges my workpiece when it put it back on to start sanding again, so I constantly turn it off and on every time I lift it up which can’t be good for the tool. SO… all that said, i’m hesitant that this one may have the same problems. I’ve had the exact same problem on two Milwaukee sanders in a row. I got to turn it on with the pad engaged with the wood or it spins like crazy. I hope the M18 addressed this. Yes Dewalt needs to be taking aim at this. 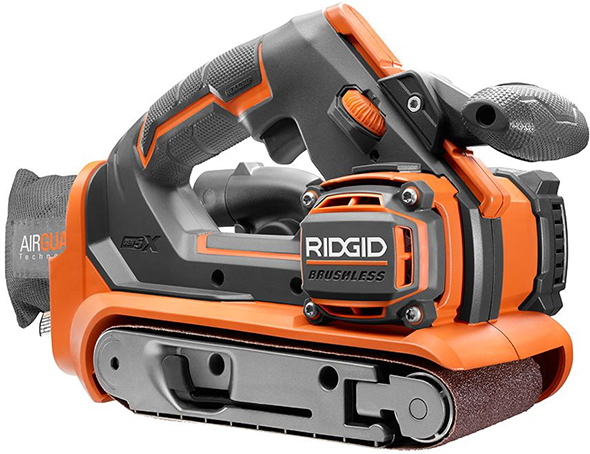 meanwhile looks like a good product from milwaukee – I never really thought I’d want to consider a cordless sander based on what I normally have to use one for. but I find I reach for my OMT and it’s sander pad often. very often. I wonder if it is related to the AEG/Ridgid unit? I picked up the AEG unit + the AEG Multitool (Ridgid JOBMAXX) earlier in the year and used it to refinish a bookcase. Great tools to work with and I managed to to sand down the bookcase on 2x 5mAH batteries between the two tools. This may replace my trusty PC for polishing cars – hanging the cable over my shoulder so it doesn’t touch the paint gets a bit old. I finally got one of these. I like it Pros: plenty of power, good dust removal. Cons: 3 piece dust port (is 1 too many), dust collector is low (less than 1/2″ to sanding plane). I am overall impressed. I was very disappointed with this sander. It sands well has plenty of power and lasts long enough for small jobs but if you do not keep it firmly on the work is spins uncontrollably and gouges the work. As soon as you go around a corner or change surfaces it has to be turned off and then wait for it to slow down before you can continue.